The timing of that looks odd - no start given but disruption until 20:30. The Met Office yellow warning for wind and rain for the South West, which was issued for late tonight until the middle of tomorrow, is now timed for "Between 13:00 Fri 9th and 23:59 Fri 9th". The wind is forecast to peak above 38 mph from the south at about 17:00 and high tide is at 19:12. So far they seem to be using a mixture of the down line as normal but then sending the occasional one over the reversible line. Both the 15:03 and the 16:03 from Paddington are booked to make extra calls at Dawlish and Teignmouth with the stoppers being either cancelled outright or turned at Dawlish Warren presumably to thin the traffic out. It's November, we're in England, therefore there's a pretty good chance it's going to be wet and windy, which is basically what this weather is. Yellow is the lowest level warning given by the Met Office. Is this now what we have to expect on the railway in this area every time anything approaching winter weather looks likely? I hadn't noticed that the GWR announcement is only for today, while the more severe (yellow) weather is tomorrow. Today the forecast is for less wind (over 29 mph) from a similar direction, but staying later this evening. As high tide is also much the same, the end time of 20:30 still looks odd, but so does the fact that it is today not tomorrow! I fear it is....and five winters on from the big washout, we are no nearer to having an alternative route west of Exeter to cover for closures. Not one inch of track has been laid north of Bere Alston towards Tavistock and no trial services have run to Okehampton: ideas, proposals, good intentions, enthusiasm and discussions aplenty but it terminates there just as surely as the trains continue to terminate at Exeter St Davids. National Rail tweeted this afternoon that there will be another complete closure to traffic tomorrow afternoon/early evening. I'm not sure if they've jumped the gun as nothing has come from Network Rail, GWR or Crosscountry yet, but be warned in case. It's almost as if NR are goading the Government to provide funds for an alternative route. Perhaps the leasing agreement with Hitachi for the IETs includes something about not exposing their new trains to salt water? I don't think that's the case. IETs were allowed through Dawlish during storm Callum. GWR stating the line could close. It has already said that passengers should travel earlier and refunds are available irrespectable of ticket type, if they decide not to travel, etc, etc. Indeed. Sadly, sewing the seeds of doubt about whether a service will run tends to put people off using that service - and not only for the one occasion (!) that the doubt is sewn. GWR are in a difficult position, as they would be regarded as being somewhat cavalier if they didn't warn people should the risk be a significant one, but yet being scaremongers if it remains open. Thought 2. The roads seem perfectly able to stay open even when the trains are not running. One of the situations under which road replacement is NOT provided is if there are similar (weather, etc) issues with the roads that there are with rail. But I note that although the weather is closing the railway at times at Dawlish, it is not closing the alternative roads. for the record (and to inform our readers here) ... what GWR are saying. No timestamp I could see on this - but it's now 6 a.m. and refers to THIS evening, so it's less that 6 hours old. Interesting that it also refers to TOMORROW ... so are we in for Saturday issues too, or is this an incomplete update on what was put out yesterday (which is what I suspect). Sever weather predicted for this evening (Friday 09th November). Current weather forecasts suggest a combination of high winds and a higher than normal tide are likely in the Dawlish area between 1830 and 1930 at the earliest tomorrow, which could affect train services between Newton Abbot and Exeter. While it is possible this forecast could change, we would encourage customers planning to travel through the area this evening to travel earlier if possible. Customers with reservations for a particular train will be able to travel on trains earlier the day. We would expect trains to run outside this area to continue to run and rail replacement bus services will operate between intermediate stations. Journey times are expected to be extended by up to an hour, depending on road conditions. Network Rail will be monitoring weather conditions carefully throughout tomorrow, and we will let customers know if the situation changes. GWR plan to continue to operate trains between London Paddington and Exeter St Davids, and between Newton Abbot, Plymouth and Penzance, however services may be cancelled at short notice or delayed, depending on conditions on the ground. Customers should check before they travel for the very latest information. The anticipated heavy rain and high winds may also impact the rail services that GWR is able to operate, potentially leading to longer journey times and further short notice cancellations. Those with tickets to travel on Friday 09 November will be able to use their tickets to travel on Saturday 10 November; customers with pre-purchased Advance and Off-Peak, and Super Off- Peak tickets will be able to travel on earlier services, and customers who choose not to travel will be entitled to a refund. GWR tickets will also be valid on a host of other transport providers, including local buses and alternative train routes. Further details below. Strong winds and high tides mean the line between Exeter and Newton Abbott may need to be closed to ensure passenger safety. Once the poor weather passes Network Rail engineers will inspect the railway before opening the line as soon as it is safe to do so. GWR expects to be able to operate train services between London Paddington and Exeter St Davids. GWR expects to be able to operate train services between Newton Abbot, Plymouth and Penzance. GWR expects to be able to operate a train service between Paignton and Newton Abbot. 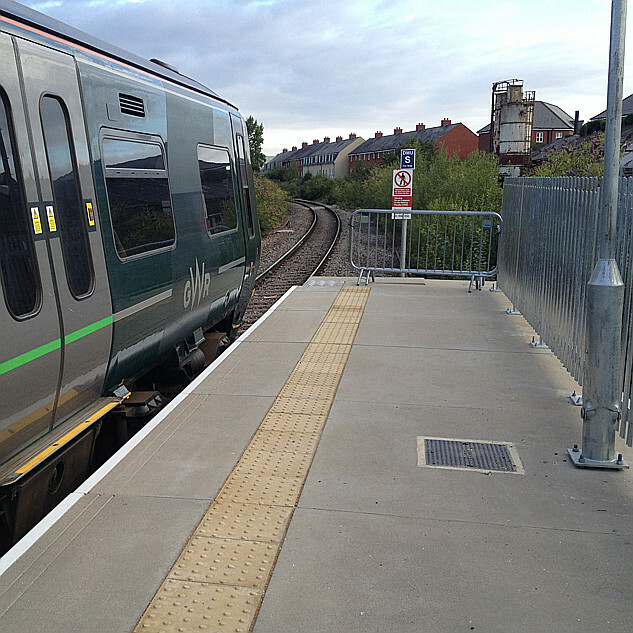 GWR expects to be able to operate a train service between Exeter St Davids and Exmouth. You can use your ticket on both GWR and CrossCountry train services for travel between Bristol Temple Meads, Taunton, Exeter St Davids and Penzance in both directions. You can use your ticket on South Western Railway train services between Exeter St David’s and London Waterloo. You can use your ticket on London Underground for travel from London Waterloo to London Paddington, however, industrial action is planned on the Central, Waterloo &City and Piccadilly lines on Wednesday 07th November with a very limited service. Please check the Transport for London (TfL) website before travel. Stagecoach bus route 2: Newton Abbot (Sherborne Rd) - Teignmouth - Dawlish (Green) - Starcross (Station) - Exeter (Bus Station). Stagecoach GOLD bus route: Torquay (Grand Hotel) - Paignton - Totnes (Station) - Ivybridge - Plymouth (Royal Parade). If your train service was delayed or cancelled, you could be entitled to a refund or compensation, please check our Refunds and Compensation page for more information. Think the topic title needs amending as well, as this looks like its going to possibly continue for a couple of weeks. Unfortunately, and not wishing to sound unduly morbid, this is partly due to the difference in perception between the two modes should the worst happen. If a road accident occurs on this route during this time and people sadly lose their lives, unless it is a huge incident, it is likely to make the local news only for a very short time before it fades into the background. 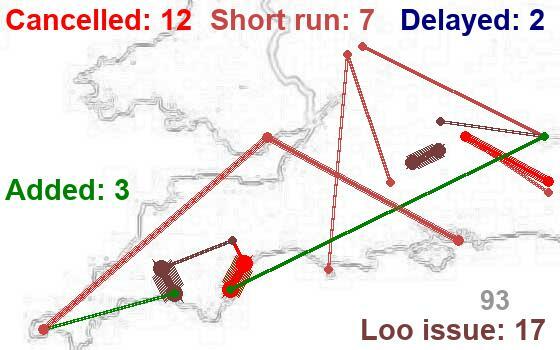 However, should a rail accident occur with equally sad loss of life, or even no loss of life if it is a particularly major incident, then it is likely to make national news headlines, stay up there for a long period, and have huge, unpredictable, and probably game-changing consequences for the entire UK rail industry. For the avoidance of doubt, I am not for one moment suggesting that one life lost in one set of circumstances is worth more or less than one life lost in another set of circumstances - each is an individual and often collective tragedy. However, I feel it is highly likely that someone, somewhere will have been considering matters along the lines of the previous paragraph when embarking on the current Dawlish strategy. And where is there a major road along a sea wall? Near to Dawlish there's the A379 Slapton Line, but that does get closed by storms, and needed major repairs this year after storm Emma. And it's not exactly a trunk route.